I have written about trying to come up with sugar-free ice cream alternatives here and here. It’s been a challenge to which I return from time to time. A few days ago in our Killarney shop, I met a family with an 8 year old girl, Shona, who was recently diagnosed with diabetes. It has given me another push. The difficulty in making a sugar-free ice cream naturally (and I won’t do it any other way) is that diabetics need low-fat as well as sugar-free (at least according to all the medical advice I have received). That makes it very, very hard, at least in my experience, to make a commercial product both tasty and viable. We haven’t given up on it, but in the mean time, I though I’d pass on a few sugar-free frozen desserts that are easy to make at home, extremely yummy, and free of, or very low in, refined sugar (sucrose). Not all might be appropriate for every diet – I know that bananas are quite high in fructose, but that’s where I’ll start. I will also pass on an ice cream recipe or two in the coming days. My mother often kept frozen bananas in the freezer for us when we were small, and we loved them! It’s a great treat that won’t have a little one bouncing off the walls from a sugar high. 1. Peel a ripe banana. 3. Push a plastic spoon or lolly stick into one end. 4. Put it/them in a freezer-safe dish and stick it in the freezer for a few hours. That’s it! You can serve them straight from the freezer, and they will disappear quickly. i love these! a good way to use up ripening bananas, and vegan too. will try the chocolate addition next time. 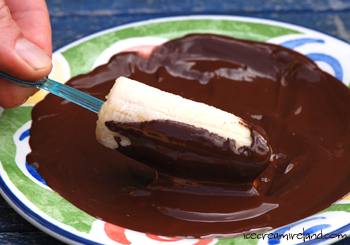 I’ll give this idea a try with my little one, but her heart will always belong to your chocolate ice-cream. THIS is a terrific idea! Especially with the chocolate on top..
For a summer ‘ice cream’ treat I sometimes throw some frozen banana chunks into a food mixer with fresh raspberries, strawberries, etc. 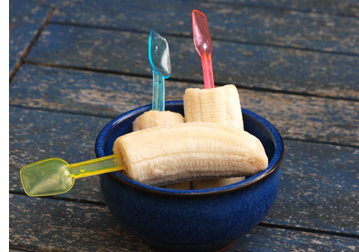 In the winter I reverse the process – frozen soft fruits with fresh banana. It’s not ice cream as we know and love it, but it’s a lot nicer than any commercial ‘diet ice cream’ on the market. I also keep a small bunch of white seedless grapes in the freezer for a refreshing nibble on hot days. Could you use the grain sweetened chocolate chips found in some health food stores instead of diabetic chocolate???? This is a great and wonderful idea. I definitely have to try it out.